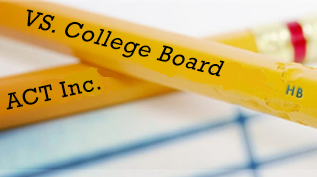 Standardized college assessment giant ACT Inc. recently announced that it has released a new test as part of an apparent student bidding war between ACT Inc. and The College Board’s SAT college preparatory system. According to Education Week, the new PreACT will be available for high school sophomores starting in the fall of 2016 and will serve as a smaller version of the ACT (clocking in at just under two hours). The PreACT will include the same multiple-choice template of English/Language Arts, Math, Reading and Science sections and will be scored on the same 36-point scale. Unlike the ACT, there will be no essay portion of the exam. ACT officials have stated that the purpose of the PreACT is to give students a “preview of the experience of taking the ACT, and a sense of how they’ll do on the college entrance exam” (Education Week). But, the question remains: is the real purpose of the PreACT to give ACT Inc. another push to the top of the college prep market? The PreACT ‘s target student is the same age as the College Board’s PSAT target student, and at $12, the test is slightly less expensive than its rival. As most of us are aware, the College Board released a completely redesigned SAT this year, which includes notably similar sections and questions to the ACT. In recent years, the ACT has become the preferred exam for college admissions, and most college counselors agree that the SAT redesign was implemented strategically to serve as a more difficult version of the ACT. This would allow the College Board’s SAT to reclaim its crown as the standardized test of choice for Ivy League and top-tier universities. While most counselors have urged students to take the ACT until the College Board settles on the new SAT’s scoring rubric, ACT Inc. is obviously feeling the heat. Many admissions counselors cannot help but wonder if the PreACT is just another plea for more money and notoriety. In other words, are these test innovations really meant to benefit the students or the standardized test makers? This latest piece of news seems to indicate that it may be the latter. According to ACT Inc., the PreACT will “provide a realistic ACT test-taking experience, to provide feedback on performance, and to help students better understand their current challenges and potential opportunity paths.” The PreACT purports to give college counselors a better indication of students’ weaknesses and opportunities for advancement, but unlike the PSAT, the PreACT will not directly tie to any scholarships or advanced summer programs (at this time). So, with a 10th grade assessment test that is comprised of retired ACT questions that can be found online with no direct link to achievement opportunities, what is the real benefit here? While many college counselors argued for this preliminary test to help aid the assessment of students’ challenges and postsecondary options, the timing of the announcement of the PreACT has left most of us a little concerned. The test’s predecessor, the ACT Aspire system, was purchased by over 900 Common Core schools without any indication given by ACT Inc. that the PreACT was in the works. The surprise PreACT announcement compounds confusion for college counselors and their students on what has already been a maddening scramble to find the best assessment of the individual student’s future. Think of the wasted time, money and resources squandered by schools on the previous program, which has now been rendered obsolete. In the race to achieve, the prudent realists among us are more and more concerned that the only real winners in all of this change are the test makers and their bank accounts.